This week’s WIN-It-Wednesday is sponsored by a company that believes in good food – and their name reflects their commitment… Food Should Taste Good! If you’re not yet familiar with the products that Food Should Taste Good offers you must check out their website and give their chips a try. All of the fabulous chip flavors that Food Should Taste Good offers are packed with unique and sophisticated ingredients. The variety of flavors… from sweet, to spicy, to savory… makes snack time a fun time! These wholesome flavorful chips, made with all natural ingredients, capture the great flavors by cooking them INSIDE their chips. Ingenious! And for all of you that are already lovers of the Food Should Taste Good brand, be on the look-out for their NEW PRODUCTS! Among them are a line-up of Kettle Cooked Sweet Potato Chips in awesome flavors like Barbeque, Salt & Pepper, Salt & Vinegar, and Original. As well as a new Kettle Corn Tortilla Chip. Yum! I can’t wait to give these all a try! I love that Food Should Taste Good has unique and exciting flavors. They’re a chip company that thinks beyond the boring potato. Some of the more interesting chip flavors that Food Should Taste Good offers are: Olive (perfect with tapenades), Chocolate (smothered in apple sauce or cinnamon cream cheese), Lime (guacamole anyone? ), The Works (the ultimate dipper… hummus? sour cream? the kitchen sink?) and, my favorite… Sweet Potato (eaten plain or crumbled on top of a fresh garden salad). Besides the knock your socks off varieties, that pair well with all kinds of dips, spreads and tapenades, Food Should Taste Good is also certified gluten free, dairy/lactose free (all flavors – except for the cheddar! ), cholesterol and trans fat free, MSG free and also made with non- genetically modified ingredients. Plus, all the chips are certified vegan (except for the cheddar). Good taste, good variety, good for you, and just plain old good ingredients, are all the good reasons why I am so excited that Food Should Taste Good is this week’s WIN-It-Wednesday giveaway on BeFreeForMe.com. Four (Yes 4!) LUCKY BeFreeForMe members will win a Food Should Taste Good snack pack jam packed with a dozen Food Should Taste Good snack sized Sweet Potato chips … my all-time favorite. Two (2) winners will be randomly selected from the entries received before Tuesday, April 24, 2012 at 11:59 AM and two (2) more winners will be randomly selected from all entries between Wednesday, April 25, 2012 and Tuesday, May 1, 2012. So make sure you enter two times to win! Reply to this blog and tell us your favorite Food Should Taste Good variety or the flavor you would like to try most. This entry was posted on Sunday, April 15th, 2012 at 8:07 pm	and is filed under Win-It-Wednesday. You can follow any responses to this entry through the RSS 2.0 feed. You can leave a response, or trackback from your own site. carries the line. Hope I win!!!!!! I would like to try “The Works”. Sounds delicious. We have only tried the sweet potato so far. I would love to try the salt and vinegar as well as the lime chips when they become available! I’ve never had these and they all sound good but I’d love to try the Cantina flavor. I haven’t had a tortilla chip since I had to go gluten free. My favorite so far is the Olive. I really want to try the sweet potato so I hope I win! Thanks. Anything Sweet Potato has got to be good! But the Chocolate one….MMMMMMM!!!!! I would like to try a jalapeno, cajan spice chip. I love sweet potatos. They are so good for you. All the vitimins in them. This sounds great. Can’t wait to try them. What a great snack or would be good with a sandwich. I would love to try the barbeque! Sweet potato sounds like the best to me. The chocolate sounds intriguing. Sweet potato chips are my favorite but I’d also like to try the salt and vinegar. YUM! The sweet potato chips look scrumptious!!! I can’t wait to try them! I’d like to try the chocolate.Yum! I love these chips because I can take them to non gluten free occasions and nobody turns up their noses and I have something to eat also! They are all so good (the ones I can find) I can’t pick a favorite. I’ve never had the chocolate, I would really like to try these. They are now on my shopping list! Those chocolate ones sound interesting !! My favorite is sweet potato chips, but chocolate is a close second! My favorite Food Should Taste Good Chips are “the Works” also the “Multigrain” are delicious, I have also had the Olive and Cheddar. I have had the Sweet Potato chips, they didn’t taste as I imagined them but were good. The chocolate just seems odd for a chip/cracker so I have not had the nerve to try them. If you have not had any of these chips I suggest you do so they are so tasty! With a dip or all by themselves they are good. I love the sweet potato chips. They are my favorite. I have never tried “The Works”. I would love to try that variety. Let the dipping begin!!!! My favorite flavor is the sweet potato chips. They are delicious. Sweet potato chips are my favorite with the chocolate running a close “second”. They all sound good, but would like to try Sweet Potato. I love the sweet potato chips! I would like to try the chocolate flavor, that sounds tasty. I would love to try the chocolate. I had a recipe that used that flavor, but I haven’t been able to find it anywhere near me! I love tangy lime-flavored foods, so that’s the one we’d love to try. I love the sweet potato, and I would love to try the chocolate! Love love love the sweet potato tortilla chips! Chocolate sounds even better and can’t wait to try it! would love to try CHOCOLATE!! My favorties are the sweet potato and the original multigrain. I like dipping them in hummus for a simple and delicious snack. I LOVE the Olive chips, although there are many I have yet to try. I would like to try the chocolate ones, but no one around here (Flint, MI) carries them. I would love to try the chocolate ones for a different type of snack chip! But they all sound great!. i love the cheddar ones! I love the Multigrain Chips the best, but the Sweet Potato are awesome too! I have never tried any of them, but the Kettle Cooked Sweet Potato sounds divine! I haven’t heard of these until recently, so all the flavors intrigue me. But I must admit, The Works and cheddar sound really appealing right now. I love Salt and Vinegar, but I must try the Chocolate ones! I would love to try the sweet potato flavor. It sounds totally yummy! i love the olive and sweet potato varieties – would love to try them all!!! 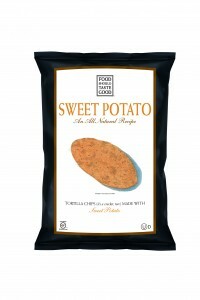 We LOVE the sweet potato chips and are happy they are gluten-free! Lime is my favorite – just a little hint of flavor, perfect for dipping in quacamole or salsa! I have only tried the sweet potato and LOVE them! I can’t have potatoes but I love their sweet potato chips! I have never try any flavour of that chips. I would like to try sweet potato and olive looks yum.. Chocolate flavor sounds yum as well. The sweet potato chips sound awesome! Would love to try most of them, but the cheddar sounds really good. I love the sweet potato chips. They are so good. My favorite is the Works, tastes like an everything bagel, so good. And I would really like to try the Blue Corn Dipping, they look great. My family is new to Gluten Free and we are interested in trying all of the Food Should Taste Good products. The whole family LOVED the sweet potato chpis and we also liked the muli-grain. Haven’t seen any other flavors in the stores nearby but am looking forward to trying new ones. Jalepano sounds interesting! I simply love, love, love the sweet potato chips. i too have a really hard time stopping once the bag is opened. i never knew about the chocolate flavor though…..that might give sweet potato a run for the money… thanks for your products!! I love both the Chocolate flavor and the Sweet Potato flavor. I can find great combinations for either of them. Appetizer and Dessert chips! I love the sweet potato! I’d love to try the Sweet Potato! I would like to try the WORKS flavor. Sounds great. and I absolutely love chips. all chips. So I’m sure to love these. I like the Works and Sweet Potato flavors the most. And I would like to try the Blue Dipping chips and the Toasted Sesame chops. I have never heard of these before,but would be happy to try anyone or all of these foods! Love the sweet potato!!! Would like to try the “Works”. It sounds interesting!! The works sounds the best to me but the chocolate might be interesting to try. They sound great. I love sweet potatos. I can’t wait to try the bbq and salt and vinigar. Mmm chocolate? Certainly worth a try! Sweet Potato crumbled on salad–hadn’t thought of that, but that sounds perfect. I enjoy a crunchy topping on salad and will give this a try (whether I win or not). Looking forward to trying all the flavors! Sweet Potato Chips are my favorite. My all time favorite is the sweet potato chips. I bought a bag yesterday and ate the whole thing! Once the bag is opened, it is hard to resist! I’m going with Lime this time. YUUUMM! I love the multigrain and sweet potato. Goes well with soup. As delicious as the Sweet Potato are, I would LOVE to try “The Works” – best they are amazing! The sweet potato is YUMMY!!!!!!!!!!!! Sweet! Second chances! So sweet potato it is! I’d go for the “lime” to eat with my Mexican food meal or a bag of sweet potato for an afternoon snack. So many choices, so little time!!! The sweet potato sounds the best to me! I just LOVE the sweet potato chips!!! The mulitgrain is good too and haven’t tried the lime but sounds interesting! I’d absolutely LOVE to try Chocolate!!! Chocolate anything is amazing, and chips would blow me out of the water, especially chips that are actually safe for me to eat! I’m dying to try the lime! The sweet potato chips are my absolute fave but the chocolate run a close second. Excellent product!!! I already love thew sweet potato chips so I would love to try The Works. It’s hard to find good gluten free foods. I could dip them in hummus or eat them as is but I’ll have to hide them from the kids. They love the sweet potato chips too!